I’m so excited to host a Thanksgiving dinner for the first time! I’ll be shadowing my mom in the kitchen as she passes down family recipes and we incorporate new dishes and traditions. I personally love unexpected seasonal colors. For my first thanksgiving I decorated with shades of blue and brass. First I set the scene with a blue Shambori dyed tablecloth my mom procured for our fall table. 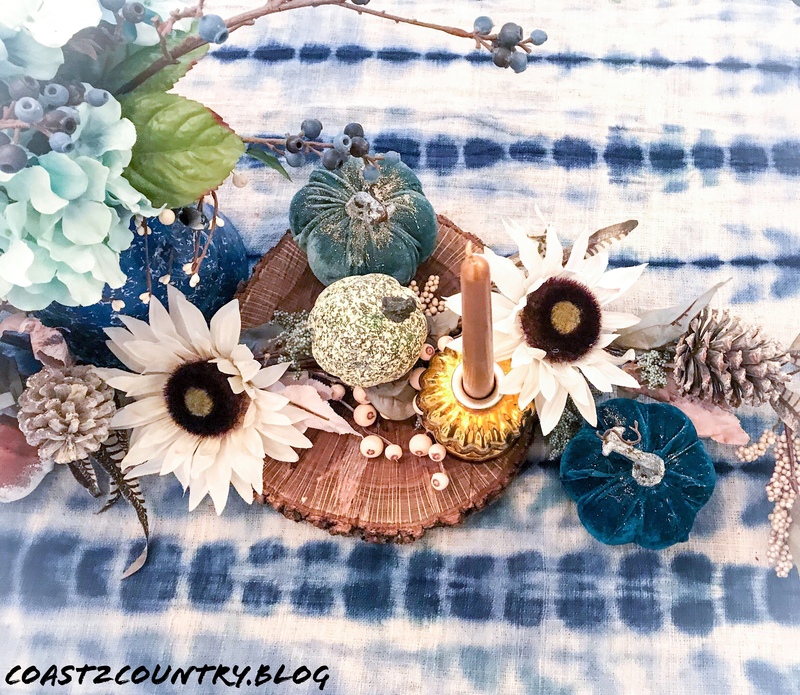 Down the center of the table I ran a neutral floral swag with white washed sunflowers, pumpkins, pinecones, berries & pheasant feathers. Natural wood slices add an earthy contrast and are perfect risers for candles or salt and pepper shakers. I then sprinkled blue velvet pumpkins and white dipped gourds into the mix. For my focal point I have an antique blue splatter enamelware teapot. My mom has an extensive collection of blue splatter enamelware and we will be using more in the kitchen as well. For the floral arrangement I added a smattering of blue and white floral; hydrangeas, berries and roses. Blue blown glass dinnerware reminds me of the ocean and makes for a non traditional place setting. Thankfully our copper cutlery matched nicely as well.